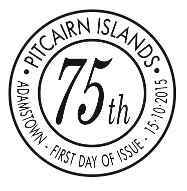 October 15 2015 is exactly 75 years since the Pitcairn Islands released its first issue of postage stamps. The journey to get to this stage was long and slow and began in 1887 when Pitcairn was formally incorporated into the Empire under the British Settlements Act. Officialdom refused to consider issuing stamps, even after a formal proposal from a Mr Petch in 1905 when his design was presented to the Colonial Office. Pitcairn mail did leave the Island, however, with the first known example being recorded in 1882 bearing a US stamp. Pitcairn was "recognised" in 1921 when covers being sent were impressed with a rubber handstamp inscribed: POSTED AT PITCAIRN ISLAND – NO STAMPS AVAILABLE. 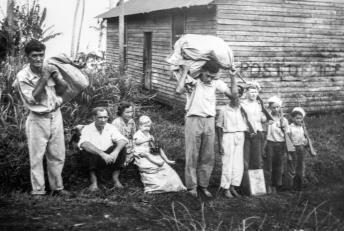 In 1927 a postal agency was established on Pitcairn by New Zealand authorities, after which NZ postage franked most of the mail that left the Island. The recognition for who was responsible for the first stamps (eight definitives) is unknown. 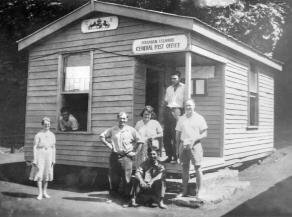 H.E.Maude, then Crown Commissioner for Pitcairn, spent time on Pitcairn in 1940 and took a keen interest in the situation and eventually set up the first Post Office. 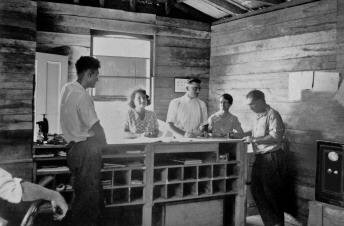 A.E.Fuller of the GPO in Fiji, where Pitcairn postal affairs were to be administered, was also involved. He in fact accompanied the first shipment of stamps to Pitcairn in September 1940. Dr Arthur Delaney, from his article "Pitcairn’s First issue" (SPA Journal, Vol. 33, Nov. 1970), from whom most of the background is taken and gratefully acknowledged, writes that the inspiration for the first issuance of stamps must go to Karl Baarslag who visited Pitcairn in 1935 as a radio officer on the yacht Vagabondia. He discussed with Andrew Young (Pitcairn’s unofficial postmaster at the time) about Pitcairn possibly having its own stamps. The Commissioner had turned down several petitions from the Island but Baarslag gave details of a similar example for the island of Barbuda in the West Indies. Young and the Chief Magistrate, Parkin Christian, then planned their strategy and Pitcairn had its own stamps five years later. The designs for the first issue also had a difficult journey. A number of essays were submitted to the King for approval but several were sent back for revision or rejected outright, including an image of Fletcher Christian superimposed on a view of Bounty Bay. (Christian did make it however on the 1d, 1/- and 2/6 stamps). These original designs are now housed in the Royal Collection at Buckingham Palace. 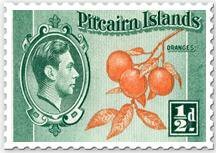 The intent of the originators of Pitcairn’s first stamps was to show the Bounty saga, although the link of the oranges shown in the ½ stamp is somewhat dubious. All stamps incorporated the Bertram Park portrait of King George VI as an inset. Other design points to note are the inclusion of Christian and five mutineers (1d and 2/6 stamps) from the print "The Mutiny on the Bounty" by Robert Dodd (1790), now in the collection of William Dixon, NSW, Australia; the portrait of Fletcher Christian (1/- stamp) (artist unknown) also in the Dixon Collection; Bounty Bay (2/6 stamp) taken from the book "Pitcairn: The Island, the People, and the Pastor" by the Rev. Thomas Murray (1855); John Adams (1½d stamp) from the drawing by Capt. R. Beechey(1825). The engraving was by H. Adlard who also engraved the image of John Adams’ house shown in the 1½d stamp. Bligh’s image in the 2d stamp is from a sketch by J. Russell and engraved by Adlard and the Bounty was adapted from a still from the first motion picture in 1935. The printing of the first definitive is also interesting. The 1d, 3d and 2/6 stamps were printed by Bradbury, Wilkinson and Co. Ltd. of London and were slightly smaller than the remaining values which were printed by Waterlow and Sons Ltd. of New Malden. The entire series was recess engraved and printed on paper watermarked with the multiple crown and script "C.A." of Crown Agents. A new Post Office was constructed and the first definitives went on sale on October 15 1940 and were withdrawn on July 1 1957.Eight reprintings were made during this time. Sales were staggering - Maude and his wife stamped covers for 16 days although the date stamp remained firmly on 15 Oct. 1940! After this it was destroyed to stop entrepreneurial Islanders from profiting into the future. In 1951 the original eight definitive stamps were joined by two additional stamps featuring the original Bounty Bible (4d stamp) and the Schoolhouse, as seen in 1949 on the 8d stamp. Both stamps were designed to fit into the definitive family look with the King’s head inset as for the original designs. The Pitcairn Islands Philatelic Bureau has added the two 1951 stamps to this issue giving the 2015 definitives a total of ten stamps. This is to ensure most make up rates are covered (the 2007 definitives featured 12 stamps) and to treat the 2015 release as a commemoration of the "early" definitives in addition to the "first" definitives. The First Day Covers show early photographs of the Post Office and staff, including Roy Clark. What is also interesting on these covers are the two cachets shown. While the first likely cachet was of the schooner Yankee, skippered by Captain Irving Johnson and used by the Islanders who produced "home-made" covers featuring the new definitive, the first cachets specifically prepared are known in philately as Types 12 and 13. The designer of Type 12 is unknown and all the text is with the type in blue. Type 13 is thought to have been designed by R.H. Mower of San Francisco, California. 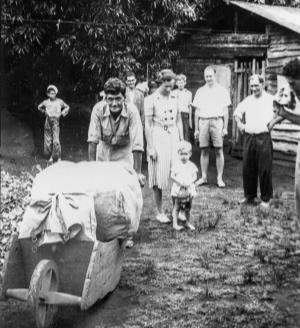 His cachet refers to Pitcairn as the Gem of the South Pacific. The Philatelic Bureau is proud to both commemorate the 75th Anniversary of Pitcairn’s first stamp issue and brings you the amended original designs that are fitting for such an important occasion. Denominations: 10c, 40c, 60c, 80c, $1.00, $2.00, $4.00, $5.00, $6.00 and $10.00. 15 October 2015 for a period of approximately 7 years. Acknowledgement: The Philatelic Bureau appreciates the assistance of Herb Ford, Everett Parker, Vernon Kisling, Dr Arthur A. Delaney and the use of images for the FDCs from the collection of Tony Probst.